The mist-shrouded Gloomspires have defied local seafarers and treasure hunters for centuries, but Venture-Captain Calisro Benarry has nearly unlocked the secrets of the spire where the dread pirate Sevenfingers hid his treasure. 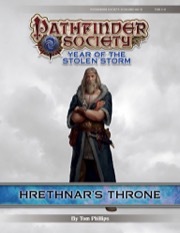 Great prizes beget jealous rivals, though, and the PCs must be prepared to fend off all others who desire Sevenfingers's riches—rivals both past and present. tldr: Bad first fight designed to kill parties by forcing them into a 10x10 box against a bomber character with no prep time (I don't know if he was supposed to be fully buffed prior to battle or not, but ours was and basically ko'd 2 of us before we even acted - we survived, I guess, or at least that is what our chronicle sheet says). 100-190 hp worth of mobs vs. whatever is in your party from every encounter. "Trap" that sidelines a party member if you fall for it. Lie to guardian or end module. Lie to captive traitor or lose PP (or end module). Fight BBEG mage in yet another box (ship). If you aren't optimized to dish out damage, be prepared to face at least your entire party's HP worth of monsters in every battle. Twice that if you play high tier. Broken. In the high tier version there's also a trap that kills on a failed save, so there's that. And the eel swarm critters - plural - because what's more fun than dealing with ONE swarm creature? Dealing with two of them. Three+ things designed specifically to kill or permanently disable the PCs (wish required for a 9th level party??? yeh, you're dead, basically). If I could have given it zero stars, I would have. Nobody said being a pathfinder was easy. I really hate that b***h captain who disappeared as soon as the fighting started. And apparently the option to "run back downstairs to take cover and prep" doesn't exist because there are no stairs on the ship. Broken. If I am at 5th level, that is 15k XP base. I'd end up with 37600 XP in the end. Normal track = level 7. Let's ignore the God Level trap for now. So Straight out, you have a group of 4-5 level 5's. CR 9 DOESN'T EVEN MAKE IT ON THE DESIGN CHART! Max should be ONE CR 8 (EPIC) encounter (per design rules). As is, APL 6 has TWO EPIC encounters. And as it is, in PFS, you get 1/3rd of a level, 1 or 2 PP. Where the H**L is my FAME for being dumb enough to do this at level 5?! If I were in a home game this single module would have given me 2 levels and (at least) 4 Fame (I calculated at least 12 for a 5th level party). But hey, it's PFS. Go "die" in the first 12 seconds. I maintain that no 5th level character should ever be allowed to enter this module. 11850 gp in normal play. PFS? 2604 (to 5383 at tier 7-9). This is the only thing NOT broken (if you multiply by 4). I'd add that they just took the NPC level and subtracted one for the first encounter, then equipped him just like a PC, which per the encounter creation rules would mean that that should be rated one CR higher... but whatever. At this point I am just nit picking the finer points of how obviously broke this module is for low tier runs. edit: I realize after reading the module, that there were a couple of things ran incorrectly. But I stand by my opinion that this is not properly downgraded for APL 5-6. And I would give it zero stars if I could. I have now played and run this and enjoyed both. It is very atmospheric, spooky and lives up to the previous too parts. 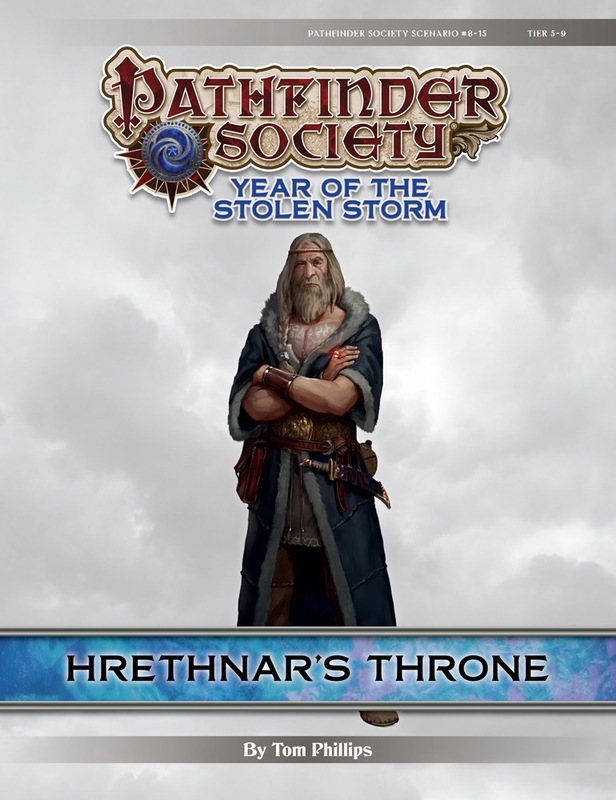 Hrenthar's story is interesting and you do actually get to learn a bit about it. I do have two issues with the scenario. Including a disintegrate effect in a 5-9, even if it is only at the high end, feels very unfair. I did actually disintegrate a PC when I ran it although in my defence he did have a con of 8 and 47hp at level 9. He could just afford a resurrection due to the silver crusade boon but it cost basically all of his prestige. Secondly some of the tactics simply don't work at all. The thing in the hold is expected to spend 3 rounds casting 1 round cast time spells in a tiny space where people will be in melee with it while the end opponent simply cannot survive anything even vaguely threatening. The optional encounter is interesting but really needed a bigger room to work. Sadly we skipped it when I ran it as the first encounter took quite a while. I have to admit I was pretty worried about playing this scenario based on what I’ve heard and seen. Supposedly it’s a very lethal scenario with a big chance to get no experience or prestige. Combine that with the low rating, at this moment in time 2 and a half stars, and I was wondering if I should play it safe or not by avoiding this scenario completely. As you can guess from this review, I decided to play it anyway. I found myself in a group with some highly optimized characters, notably frontliners. I was okay with that since my jetpack-gnome-bomber had a meatshield to hide behind. Tanks with 34+ AC are pretty handy to have. Let me tell you right now that we squishies really needed that frontline as the first fight in particular can be really painful. There’s a really big chance that there will be casualties and the later encounters aren’t exactly cakewalks either. We were just lucky with our composition and optimized characters that we (somehow) managed to stomp our way through it all, including portions where some of just ignored the enemies present. It actually made it way less creepy or scary than it should (and would) have been, which is actually a shame in hindsight. That said I enjoyed returning to the Gloomspires. While I have some issues with the ‘you go in, but we can’t get you out so you’re on your own’ briefing from the Venture-captain, I consider the rest of the scenario to be pretty well-written. Diverse encounters that throw you for a loop, interesting yet lethal opponents and scary locations all come together nicely to create a fun, yet seriously dangerous scenario. You have to come really prepared or you’ll likely suffer. It’s better than the previous part (7-19: Labyrinth of Hungry Ghosts) in my opinion and about as equally good as 6-06: Hall of the Flesh Eaters. All the writers are doing a good job of creating a scary setting and dangerous encounters. The atmosphere and immersion are always there and I hope the next installment will be of the same quality. I will say though that I do hope the encounters are a little bit toned down as this was maybe a bit over the top for anything but highly optimized characters in certain situations. I’m on the fence about recommending it. It’s a good scenario, but definitely lethal and not to be underestimated. First off I can certainly see why this scenario earned the rating it did, there is a lot of potential for party death especially in the beginning. The first and possibly the second fight can be very swingy and that is not necessarily a good thing. This is not a scenario that messes around and if you come unprepared or expecting a cake walk you will die. That being said I loved pretty much every minute of it. The monsters are cool and interesting of the type not normally seen in PFS. If you are prepared for anything and everything then the fights will be tough but winnable. The flavor of the scenario is spot on and there can be a serious creepy factor going on the entire time you are in the gloom spire. Would not recommend for new players, but for people who want a challenge this is a very fun flavorful scenario. My favorite season 8 so far. I will have to write a proper review at some point, but I played it on low, ran it in low tier with 6 players (they pretty much decimated it), and high with 3 and a pregen. The second group struggled quite a bit more, but it still seemed like a properly tuned challenge. Three are quite a few things to like, unfortunately, it has a couple of flaws that prevent me from giving more than 3 stars. Back to the Gloomspires, hooray! And my Gloomspire ranger is in tier! I'm waiting in anticipation to find out how many fingers sevenfingers really has. Twelve. Major upset—nobody will see it coming. I this a sequel to 6-06 Hall of the Flesh eaters and 7-19 Labyrinth of hungry ghosts? Chronicle has a ring of protection +2 for 4000g. I'm assuming this is a miss-print. That's a typo. When we intentionally offer a reduced price on a Chronicle sheet, we'll call it out specifically.